I have to say, yesterday was an impressive session. There was every reason to send the market significantly lower with a series of headlines that would have hammered major indices much more back in December. The Dow opened lower, plunged and then rebounded into the close. 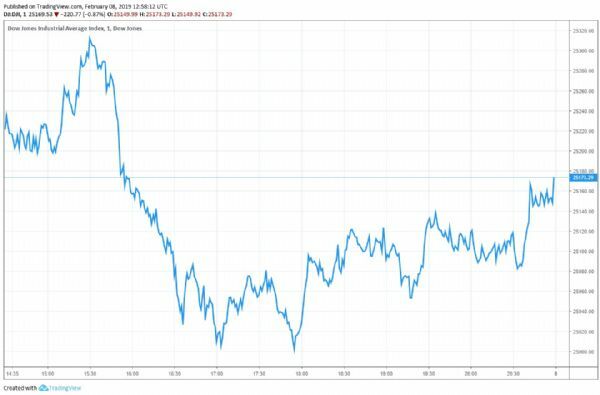 Larry Kudlow, White House economic advisor, suggested the trade deal was long way off, and there will be no meeting before scheduled hike in tariffs. Today, the market is looking to open lower. Again, I will be watching to see the action around Dow 25,000, which was a key resistance number and is now trying to establish a base of support. I think the White House needs to adjust the tariff hike deadline, but understand, doing so too soon would be a sign of weakness. Moreover, reports the administration is prepared to take tougher action against major Chinese telecom companies are sure to complicate the issue, but it shouldn’t derail the progress or an eventual deal. We sent alert yesterday suggesting subscriber take profits on Match.com (MTCH), which we had in Technology (not sure it shouldn’t have been in Communication Services). We think investors should still have exposure to Technology, where there are two bold ideas. For more help, please reach out to your representative or research@wstreet.com. If you are not a current subscriber to our Hotline, click here to get started today. Charles, we thank you for always telling Facts & TRUTH reporting. We doubled down on FSCT in dec selloff, its beat is rocking +16l% holding it as $42 PT. Your show always makes the investment decisions easier. Thank you sir. We think kudlow talk down , is a Trump walking away tactical message to China. Hands the power of outcome to China. The Lighthizer and negotiations crew, are traveling this weekend, and we read& hear, tho far along in promises, the framework is sticking on tactical neccessity of enforcement , of IP THEFT,& FORCED TRANSFER OF property INFORMATION COMPANY SHARES. So President Trump, not confirming a meeting, seems unreasonable, but , wants Xi JINPING to save face, Xi JINPING can CALL president Trump, making Xi JINPING & China seem the all powerful that controls the trade negotiations. Trump gets good news, thru a good faith call, can extend without fully raising tarriffs & adding more. Or Kudlow just brain farted, still believe its Trumps negotiating tactics, BEING UNPREDICTABLE ALWAYS. Thank you Charles PAYNE, FBN. Thank you president Trump. Life is great INVEST long. Hi Charles, love the Fox News Business Channel, watch it daily. Today, I must have missed some of the segment @ 2:00 when you were talking about the three dates to watch. Got the 2/15 with Mnuchin and Lighthizer in Beijing for trade talks, but missed the info for 3/1 & 3/29. Are they posted somewhere? Am just getting back into trading after an illness and trying to catch up on it all. Thank you and keep up the great shows, you are all make such informative, wonderful, honest news contributions! Garry is correct. The market has become a ping pong match:" back and forth between, traders, hedge funds, algorithmic arbitrage movements, and media hype and bluster. Serious Investors have to have a real capacity to find solid companies that can withstand the daily/weekly/quarterly chaos that seems to rule. Charles you seem to try and wade through this with honesty and transparency but, sadly the bulk of the assets of people who are trying to save for retirement are at the mercy of others who are not so sanguine about the markets and investments of today.